Unfortunately, my regular sailing trip clashed with the busiest fireworks weekend of the year so I was unable to meet up with my boating mates (the Pteraductyls). 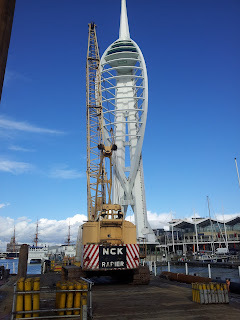 On the bright side, I did end up very close to them and on a boat (well, a barge) in the middle of Portsmouth harbour. 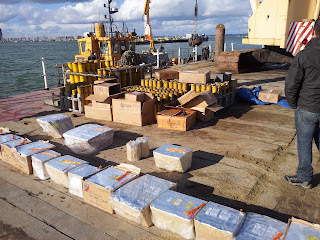 Friday started innocuously enough - I was at the fireworks yard (Rocket Park), ready to start my third day of loading vans, labelling ADR loads (for those vehicles carrying a large amount of explosives), charging radios and other essential prep tasks for the many crews heading out over the weekend. Then came a change of plan - the team at Portsmouth were down a crew member. Off I trundled with my kit box, PPE (personal protective equipment) and plenty of warm/dry/waterproof layers of clothing. The rig was very cool - a small show on the pontoon and then two barges full of fireworks. 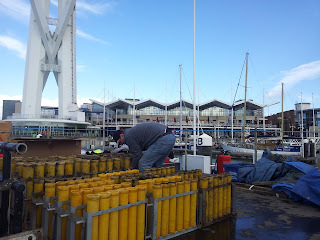 I had to roll up my sleeves and get stuck in, helping to organise the shells - those are the large fireworks that shoot high into the sky and then burst, usually into a sphere of colour. During the rigging, the barges were moored up to the pontoon which made everything much easier. 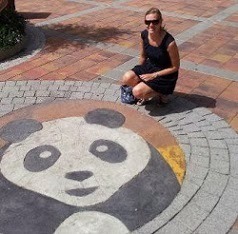 As did the sunny weather! The cakes (multi-shot fireworks) being laid out, before being secured. A shot across the barge (including the crane), showing the famous Spinnaker Tower in the background. These racks of tubes are secured firmly together for the shells, which are placed individually at the bottom of the tubes. In the twenty minutes before the show, the two barges were towed by tug boats into the middle of the harbour channel. Once in place, a test shell was fired to check the wind conditions. Ferries (for the Isle of Wight and cross-channel) hurried to and fro before the harbour was eventually closed and we had clearance to fire. 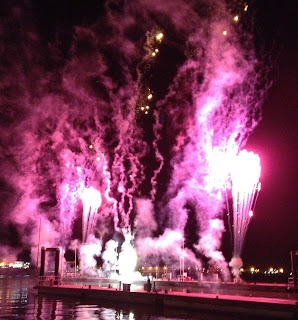 Fireworks from the middle of the harbour. There are some much much better photos from a professional photographer (using a proper camera!) 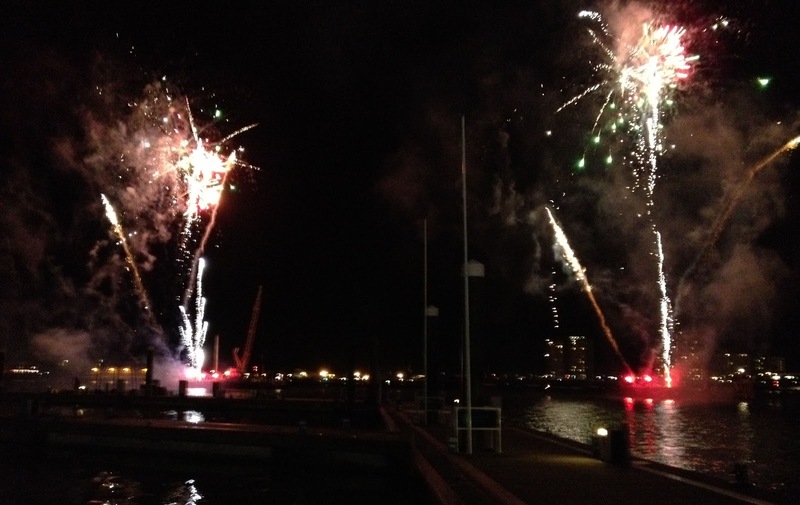 on this website: Gunwharf Quays Fireworks Display Photos. Of course, firing the show isn't the end of it. After the barges had been towed back to shore and checked for any fireworks that did not fire, we had to get on with derigging - lots of wire cutting and lifting and lugging all over again! But what a choice to be made between 2 exciting events! Lucky you.